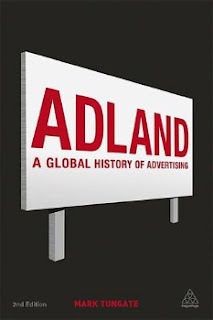 Adland is a groundbreaking examination of modern advertising, from its early origins, to the evolution of the current advertising landscape. Bestselling author and journalist Mark Tungate examines key developments in advertising, from copy advertisements, radio and television, to the opportunities afforded by the explosion of digital media. Adland focuses on key players in the industry and features exclusive interviews with leading advertising veterans, including Jean-Marie Dru, Sir Alan Parker, John Hegarty and Sir Martin Sorrell, as well as industry luminaries from the 20th Century such as Phil Dusenberry and George Lois. This new edition is updated to include a new preface, a revised introduction and touches on the effects of the current recession, the impact of recent digital technology and thoughts on the future of advertising. Exploring the roots of the advertising industry in New York and London, and going on to cover the emerging markets of Eastern Europe, Asia and Latin America, Adland offers a comprehensive examination of a global industry and suggests ways in which it is likely to develop in the future. Advertising is everywhere. Ads interrupt our favourite TV and radio shows. They have invaded the pages of newspapers, magazines and blogs. We can't even walk down the street without coming across some billboards, and if we take the bus instead, chances are its sides are covered with ads. And with the advent of digital media, things are only gonna get worse (or better, depending on what you think of advertising). Wherever we go, whatever we do, we come across someone trying to sell us something. And to be noticed by bored and annoyed consumers, ads need to become more and more incisive and creative. It's undeniable that advertising has a huge impact on our lives, but how did it all begin? Well, advertising has been around since someone first decided to sell something, but in the last 200 years it has evolved (and still is) considerably. British journalist Mark Tungate, in his book Adland, examines the key developments in the industry. The book is now in its second edition, which has been enriched with a new preface, a revised introduction, and a section about the most important developments in advertising since 2007 (when the book first came out), including the way advertisers are now using social media to promote their products and how ad agencies have been impacted by the recession. But if you're looking for the history of famous and loved commercials, anecdotes about their creation or details about the techniques used to entice consumers to buy a certain product, you will be disappointed. You won't find none of that stuff in Adland. What you'll find, instead, is a global history of the industry, of its main agencies and players. The book has an European slant, which is to be expected considering that the author is a British guy living in France and that four of the main ad agencies are based in Europe. But it also discusses the history of Madison Avenue and has chapters about Japan, Spain, Brazil, Italy... Each country has its own distinct vision of what advertising is and particular techniques that work for its audience. However, for an industry that's all about catching your attention, its agencies have long, boring names that are difficult to remember. Because of this, I've found reading about how these agencies evolved and merged together quite boring and dull at times. What was very fascinating, on the other hand, was reading about their founders, from Albert Lasker, often touted as the "true father of modern advertising," to the original copywriter David Ogilvy and the creative revolutionary Bill Bernbach. Each of them had a different vision of what advertising should be about, which they brought to life in their agencies, changing adland for good. I had never really paid much attention to the people who created the ads, but this book made me realise how talented, driven and inspired a lot of them are. Their (and Tungate's) passion for advertising really shines in this book. Even if you are among those who detest advertising, this book will make you look at it differently. Adland By Mark Tungate discusses the global history of advertising. The book introduces us to the people who, thanks to their vision and creativity, shaped the world of advertising, explains how the most famous agencies in the world evolved and what challenges they are still facing today. The book is informative and well-researched, and although some passages are quite dry and dull, most of it is written in a fast-paced, engaging tone that makes it easy to read quickly.